This post contains affiliate links, which help support this website at no additional cost to you. For my full disclosure policy, go here. Life hasn’t always turned out exactly as I’d hoped. That is especially true in my marriage. You can read some of the details in this post. So, when Lysa TerKeust released her latest book, It’s Not Supposed to Be This Way, last fall I snatched it up. I listened to it on audiobook while commuting to work. Loved it so much, I bought the hardback book to read and highlight and re-read. Then in January, I joined a Bible study group going through the DVD-driven study. It’s all good. Really good. If you’ve ever been disappointed with anything in your life, get this book! With that completely biased recommendation out of the way, let’s move on to the actual review. Just Who Is Lysa TerKeust? For those of you who might not be familiar with her name, Lysa is the president of Proverbs 31 Ministries. She has written eight books, including The Best Yes and Uninvited. I’ve read most of her books, done a few Bible studies, and gotten completely hooked. She honest and transparent and real in her writing and that draws me in. The first thing I noticed about her writing – before reading It’s Not Supposed to Be This Way – was how openly she shares what she’s gone through in her life. Lysa’s life has not been easy. She’s had challenges, like we all have. Different challenges than I’ve faced or you’ve faced, but challenges just the same. From the pain of having her dad abandon her family while she was young, to losing a beloved sister at a young age, to abandoning all pretense of religion or faith while pursuing fulfillment in one relationship after another, Lysa’s life has had a lot of rough waters to navigate. Just like your life and mine. She wrote about many of those challenges and how her faith had grown despite it all or because of it all in Uninvited. The theme of that book was overcoming intense feelings of rejection by learning to lean on Jesus. God’s overwhelming love is the solution for our feelings of rejection. He never rejects us. All we need do is come to Him with our hurts and scars and needs. It’s a deep, thought-provoking book. Lysa was just putting the finishing touches on that book – that book on rejection and God’s unconditional love that provides a safe harbor – when her life fell apart. That story is told in It’s Not Supposed to Be This Way. How Do You Survive When Everything Falls Apart? This new twist on her story, told in Lysa’s own humble way, begins with the revelation that her husband was involved in an affair. Having walked that road, I related immediately. But Lysa then endured much more than I ever had to: health challenges, issues with the house, her youngest child leaving for college, and finally cancer. 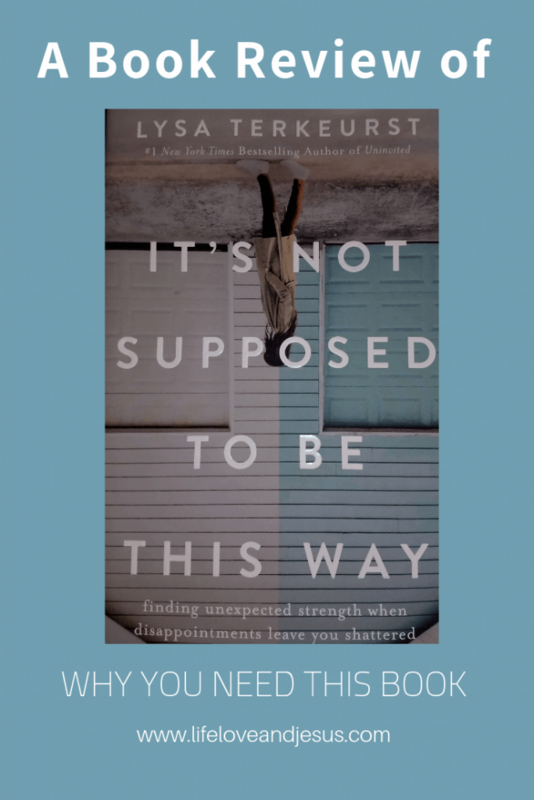 As she shares her story, Lysa never lingers on ‘pity parties.’ Although I’m sure, in the midst of living through her story she had those moments, just as I have had, and you have probably had. No, instead she lingers on God. His goodness. His trustworthiness. His incomprehensible love. In the midst of everything she goes through – in the midst of everything I’ve been through and you’re going through – in the midst of it all, there is Jesus. Constant. Loving. Providing strength when there is none. Jesus through it all and at the end of it all. This is the secret to surviving when life falls apart – just Jesus. When life is upside-down, when you are hurting, when you fear what the future might hold, there are only two choices you face. Only two choices that I face. Only two choices: Trust God or turn from Him. As another author puts it, “I only [have] two choices: He is either God or He’s not. I am either held in the Everlasting Arms or I’m at the mercy of chance…I have to trust Him or deny Him.” (Elisabeth Elliott, Suffering Is Never for Nothing). The heart of Lysa’s teaching in her latest book, aside from the overwhelming goodness of God, is that life here on earth is hard. We live in a sin-infected world “between two gardens.” Between the perfection of the Garden of Eden and the perfection of the garden of God at the end of Revelation, is this sin-damaged world. And living in this sin-damaged world are sin-damaged people. People who hurt and disappoint. People who love and leave. People we trust who wound us deeply. There is no way around this fact. We all are sin-damaged people living in a sin-damaged world. Sometimes that means we endure great pain and disappointment and suffering. In fact, not just sometimes, but many times or even most of the time. I live in the United States, one the richest, most prosperous countries in all of history. I have a comfortable life by most of the world’s standards and am amazingly rich according to those standards. I do not fear death because of my faith. I do not worry about losing my job, home, or family because of my faith. There are millions of believers around the world who face far greater challenges to their faith and problems in their lives than I do. It’s not supposed to be this way, and it won’t always be this way. Whatever you are facing, whatever I may face in the future, the truth is that God is good. His plan and purpose, His ways and His Word are all good and trustworthy. God is just as pained by our suffering as we are. He hears each cry, saves each tear, and promises a better future. It’s not supposed to be this way, so we look to the future when “God will wipe away every tear from their eyes.” Revelation 7:17. Before I share a few of my favorite quotes from It’s Not Supposed to Be This Way, let me urge you again to get it for yourself. In hard copy. I love audiobooks, but there’s something about highlighting, underlining, making notes in margins, and re-reading special sections that makes a real book so much better. Read it and re-read it as often as you need to get through whatever the Lord in His love and wisdom has decided you are ready to face. There is more, so much more, that is beautiful and encouraging in this book. Get it, read it, live it, and pass it on. Share the book if you want and share the message any way you can. The message that God is good even in the middle of the most trying of circumstances we face. He is always there. He is always loving. He is always good. When life falls apart and you cry It’s Not Supposed to Be This Way, Jesus hurts with you, holds you, and leads you through. That message is well worth the cost of the book.